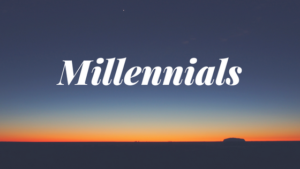 There are tons of books, articles and discussions happening around the topic of Millennial’s. More than I can ever remember, with any generation, we all seem to be fascinated with this “different” generation. There are hundreds of books and articles focused on helping you understand them, market to them, communicate with them and hire and retain them. I find it fascinating because while they are a generation that has different experiences, upbringing, access to technology, they are not as fundamentally different as many of us are led to believe. If you speak to people in the Greatest Generation, those people born in the early 1900s, they would say that many of them thought the same things about the Baby Boomer generation. This was the generation that protested the Vietnam War and actively participated in the civil rights movement. I’m sure at many points in history, the Greatest Generation thought the Baby Boomer generation was “out of control” and questioned and struggled with many of the same things we struggle with today in the generational divide. This is not a brand-new issue we are dealing with as a society. What I see is that it is not a fundamental shift in the values of the different generations, it’s a shift in how those values are communicated and on display. I believe that the Millennials hold many of the same core values as other generations, the real difference is that they are not afraid to share their values and have high expectations about how those values are met. The Baby Boomer generation had strong values as well, and they protested to support those values, but they didn’t share their values as openly and consistently as the Millennials. The Millennials clearly have more access to information and a louder platform to voice their values which is changing the way we interact with them, communicate with them and ultimately engage them in society and business. But it’s not a fundamental shift in core values – it’s a fundamental shift in how those values are on display and put into action. So, the next time you want to use the excuse that the generational differences are the root of the issues you or your business are dealing with, I want you to really examine that. Instead think about what control you have to adjust your communication approach, marketing approach or overall engagement of that generation to tap into their values and serve them differently – I think you will be surprised at the response. When we can slow down in business and realize that ideas, products or services is not what grows our businesses, people do, we start to look at the world a little differently. We start to give grace where grace is needed and it fundamentally changes the dialogue we have with all of the significant relationships in our lives – personal and professional.